Deep vein thrombosis (DVT), a potentially life-threatening disorder in which blood clots form in the deep veins of the body, particularly the legs, has been growing in recent years after several cases were attributed to long flights. DVT can lead to a pulmonary embolism (PE), when a clot breaks free and lodges in a lung. If the clot is large enough, it can cause sudden death. In an airplane, the dehydration caused by the dry air may thicken blood. In addition, the low cabin pressure, combined with immobility in cramped seats, may cause blood to collect in the legs. As a result, DVT has been dubbed “economy class syndrome.” The potential for the problem is greater when in-flight airline personnel keep the seat belt sign lighted and discourage passengers from moving about the cabin due to air turbulence. Approximately 4 percent to 5 percent of highrisk individuals may suffer DVT on flights of 10 hours or more. Swelling, tenderness, discoloration or redness in the lower legs may be signs of DVT. Unfortunately, however, there are often no symptoms at all. At the American Heart Association’s Scientific Sessions in 2001, the results of research conducted by an international group of scientists from the U.K., Australia and Italy suggested that low-tomedium risk patients may prevent DVT with compression stockings, while a single dose of heparin, a blood thinner, may work for high-risk individuals. Consult with your physician if you are concerned about DVT and to discuss how to best reduce your risk. Downdog calf stretch: Get in the downward dog yoga position, then alternate pressing your heels to the ground. Inchworm: Stand with your feet hip-width apart, then bend over and touch the ground with your hands. Now use your hands walk your upper body forward until you’re in a plank position, then drop your hips and look up. Inch back to the starting position and repeat. Figure four stretch: Stand on one foot and cross your other leg over knee so your legs are shaped like the number “4.” Now sit as low as you can go with the one leg, hold it for several seconds, then switch legs and repeat. Toes raises: Stand with your feet flat on the ground, hip-width apart. Raise up so you’re on the balls of your feet, hold it for a few seconds, then go back down and repeat. Hamstring reach & sweep: Stick one foot out in front, straighten your leg, and point your toe to the ceiling. Now bend your other leg and reach down toward the floor with your hands. Swap legs and repeat. Half kneel hip stretch: Kneel with one knee on the ground like you’re at the lowest point of a lunge. Place the hand opposite of the leg that’s in front of you on the ground as support, and extend the leg behind you until you feel it stretch. Lower it back to the starting position, swap legs, and repeat. Ankle turns: Lift your feet off the floor and move your toes in a circle, one foot moving clockwise and the other foot moving counterclockwise. Change direction and repeat. Foot lifts: Place your heels on the floor and bring your toes up as high as you can. Then put both feet back flat on the floor. Then pull your heels up while keeping the balls of your feet on the floor. Knee lifts: While keeping your knee bent, raise your leg while tensing your thigh muscle. Repeat 20 to 30 times, alternating legs. Shoulder rolls: Raise your shoulders and then move them forward, downward and then backward in a smooth circular movement. Arm bends: Start with your elbows on the armrests and your hands pointed forward so that your lower and upper arms make a 90-degree angle. 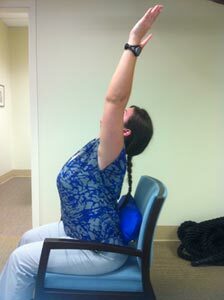 Take turns moving your left and then your right hand toward your chest and back, and continue for 30 seconds. Knee to chest: Bend slightly forward. Fold your hands together around your left knee and pull it toward your chest. Hold this position for 15 seconds and let your knee drop slowly. Change legs and repeat. Forward bends: Place both feet on the floor and pull your abdomen in. Bend slowly forward and “walk” your fingers along your shins to your ankles. Hold for 15 seconds and sit up slowly. Upper-body stretch: Stretch both arms over your head. With your right hand, grab your left wrist and pull it slowly to the right. Hold for 15 seconds and change arms. Shoulder stretch: With your right hand, grab your left elbow and pull your outstretched left arm slowly toward your right shoulder. Hold for 15 seconds and change arms. Neck roll: Relax your shoulders, let your head drop to your right shoulder and roll your head slowly to the front and then to your left side. Repeat five times.